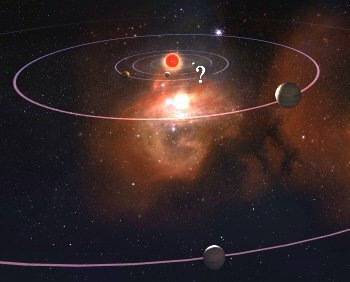 Artist's impression of the orbits of the newly detected planets. Further hypothetical planets closer to their host star have been added. Credit: KASI (Korea Astronomy and Space Science Institute), CBNU (Chungbuk National University), and ARCSEC (Astrophysical Research Center for the Structure and Evolution of the Cosmos). Scaled versions of Jupiter and Saturn, orbiting a star half as massive as the Sun 5000 light-years away, have been revealed from an effort involving a world-wide net of telescopes that includes the LT. This marks the first discovery of another system of planets that has striking similarities with our Solar System. Moreover, it suggests that such giant planets do not favour the single life but are more likely to be found in family groups. The research is published in the 15th February issue of Science. Whilst there are more than 250 planets now known, there are only about 25 such systems with multiple planets, and the newly discovered system resembles our own Solar System more closely than any previously observed. Graphs of microlensing event. The LT data is referred to here as "RoboNet La Palma". Click image for bigger version (104KB). The two newly discovered planets have revealed their existence through characteristic signatures in the received light during the gravitational microlensing event OGLE-2006-BLG-109. Rather than orbiting the observed star, these are associated with an unseen foreground star, systematically designated OGLE-2006-BLG-109L (where 'L' stands for 'lens), whose gravitational field (together with that of the planets) bent the light of the observed background star, with which it happened to be closely aligned. While planet OGLE-2006-BLG-109Lb with 0.71 Jupiter masses is 2.3 AU from its host star, the less massive OGLE-2006-BLG-109Lc, 0.27 times the mass of Jupiter resides at twice the distance. Despite the fact that their host star is only half as massive as the Sun, and therefore cooler, the OGLE-2006-BLG-109L planetary system otherwise bears a remarkable similarity to our Solar System. Both the ratio between the two masses of the detected giant planets (close to 3:1) and the ratio between their orbital radii (1:2) are remarkably similar to those of Jupiter and Saturn. Similarly, the ratio between the orbital periods of 5 years and 14 years, respectively, resembles that between Jupiter and Saturn (2:5). The contributing observations with the LT were carried out as part of the RoboNet microlensing programme, whose principal investigator, Prof Keith Horne from the University of St Andrews, remarks: "The flexible scheduling and short response time of robotic telescopes is ideally suited to carry out a time-critical programme like the search for extra solar planets by microlensing." Apart from the LT, RoboNet exploits two further identical robotic telescopes with a diameter of 2m, the largest of their kind. The RoboNet microlensing programme is spread over the network by means of intelligent-agent technology built by the eSTAR (e-Science Telescopes for Astronomical Research) Project. Dr Alasdair Allan from the University of Exeter, one of the core developers of eSTAR, explains "Single isolated telescopes are rapidly being integrated into expanding smart telescope networks, spanning continents and responding to transient events in seconds. These time-critical observations can be optimally scheduled across the network using Intelligent Agent technology which negotiates a contract for the observations with the remote telescopes". The UK microlensing planet hunters are now preparing to boost their capabilities by adopting a fully-automated three-step approach of survey, follow-up, and anomaly monitoring. Enabled by the ARTEMiS (Automated Robotic Terrestrial Exoplanet Microlensing Search) expert system that determines the optimal target to be followed at any given time for any observing site, ground-based observations with a global network of telescopes could not only lead to the first detection of an Earth-mass extra-solar planet, but even of less massive ones. Dr Dominik concludes: "While most planetary systems around other stars substantially differ from the Solar system, a series of recent detections have brought us closer and closer to home. Sooner rather than later, someone can be expected to discover an Earth-mass planet orbiting a star other than the Sun - and it could be us." Prof Horne adds, "Apart from individual spectacular discoveries, the technique of gravitational microlensing allows to infer a census of planets within the Milky Way. Once we know that planets similar to Earth are common, it is straightforward to go ahead on finding them and investigating whether these harbour any forms of life."